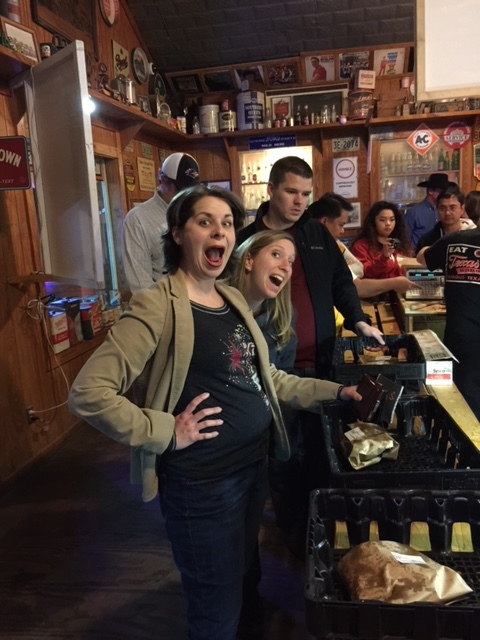 Honkytonkfoodie's Blog | Stuff about Honky Tonks. Stuff about Food. Sometime about both. Greetings! 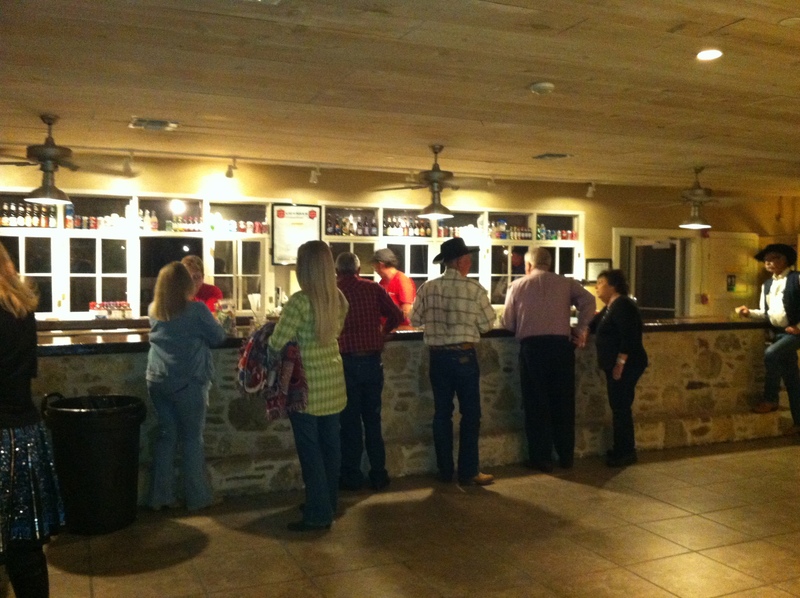 Honky Tonk Foodie articles going forward can be found at the stunning and informative website TexasHillCountry.com. Also, Honky Tonk Foodie has her own business: Redlined Editorial Services. 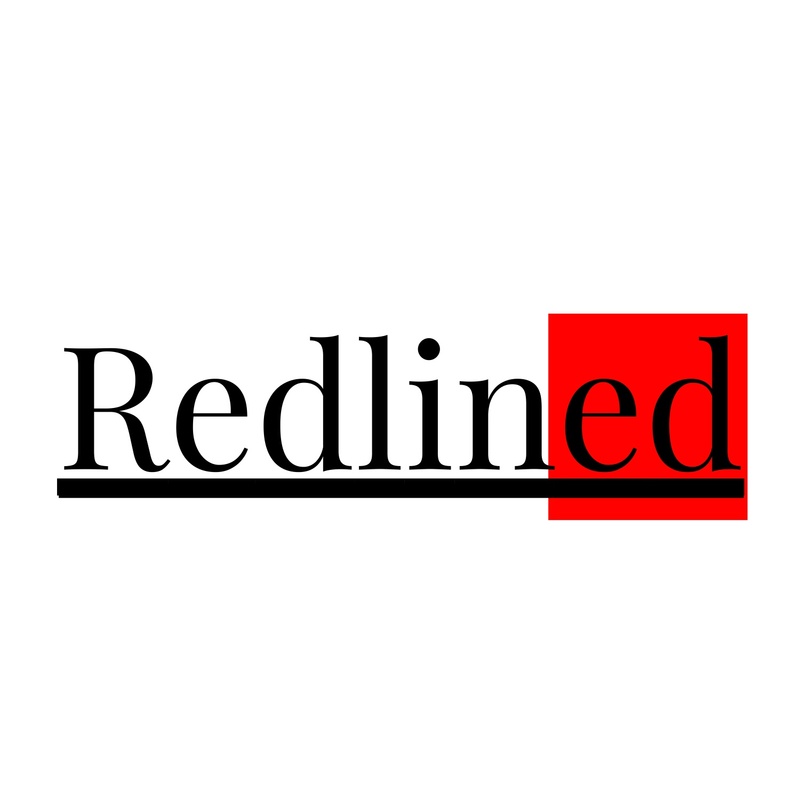 If you need written content reviewed or created, contact me via Redlined. I can’t keep my mouth closed. Not in a gossipy way but in an actual way in which a picture is being taken and my boca hinge pops open and doesn’t release until the shot is complete. But the redeeming aspect is that, sometimes, I get a little help from my friends. But to get to this part, first we had to roll out of the city and into the darkness surrounding Saint Hedwig, Texas. 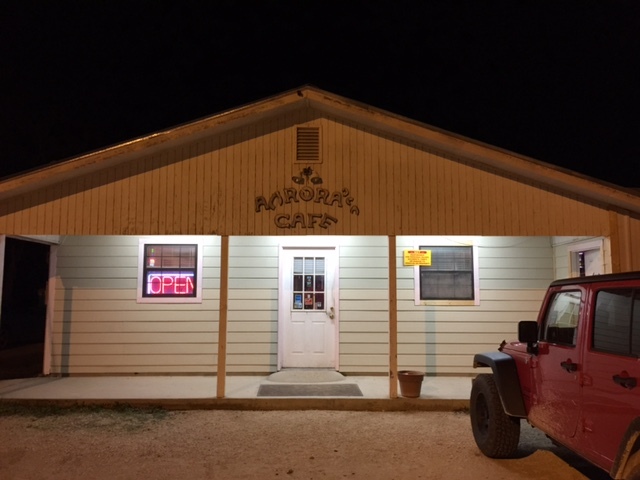 Googling the town did not reveal many dining options; Aurora’s Cafe (or Aurora’s Cafe and Bar as listed alternatively) is down a dark road. Although Cafe is definitely part of the name, apparently the kitchen is not that into working on the weekends past 3 pm. Their diligence with sign upkeep is proportional to their concern for providing food. The bartender was friendly and checked on us, but we could only swallow one beer before rushing out to the alternate dining option before their kitchen closed. 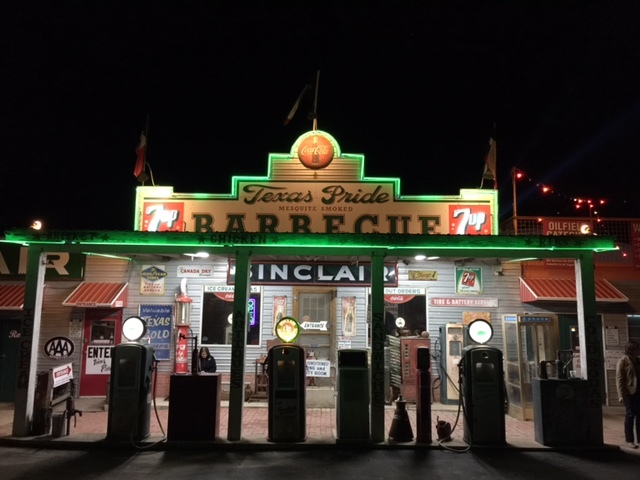 Therefore, not by design but in ultimately satisfaction of a mild curiosity, we settled on Texas Pride Barbecue, which is literally down the road. This place is a restaurant, music venue, event place and tattoo procurement shop. Ergo, there is a lot going on. The mystery of the evening formulated as a MARTA Police vehicle in the muddied parking lot. MARTA, as in the Atlanta, Georgia subway system. Acceptable comestibles but I would not recommend a special trip into the dark, dark night for this dining experience. 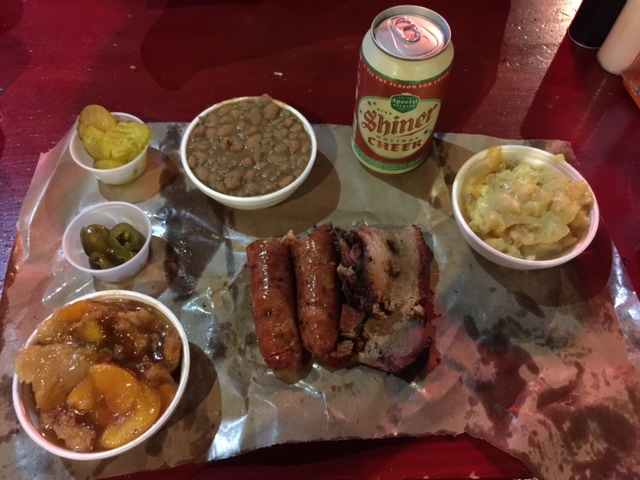 Although I was pleased to be wrong in my assumption that everything would be canned, the sides were mostly overcooked and/or under seasoned. Meat was greasy and under seasoned as well, but cooked accurately. Overall, this establishment offers a lively environment suited for large groups who need sustenance. 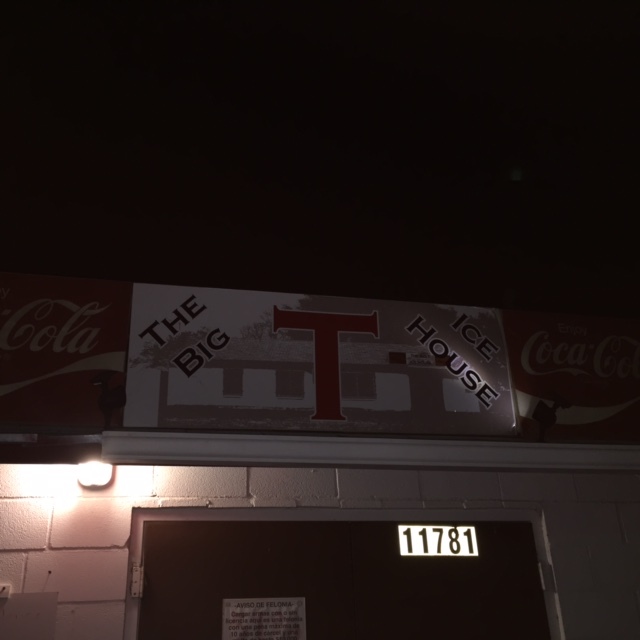 Next, we trouped out to The Big ‘T’, whose name is also adaptable and can be followed by either Icehouse or Roadhouse. 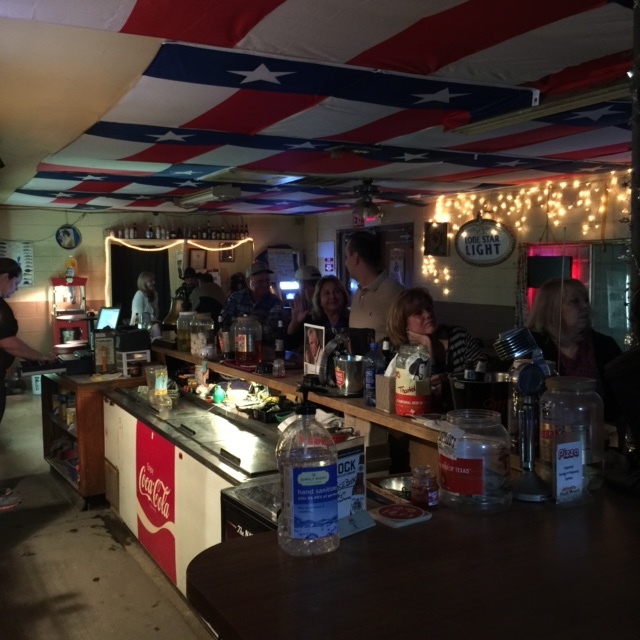 Recently purchased by Dale Watson, who I have a minor confused crush on because he looks like six different people depending on the headshot, this is a small bar with a teeny stage and one pool table. Everyone was very friendly from the moment we came in, noting the bartender would be serving us momentarily, as she was taking her turn at karaoke. A good range of beer selections, all cold. Smoking is allowed inside, which when coupled with cedar fever caused some respiratory issues for our group. A bit more ventilation would have been appreciated, but this bar has an undercurrent of joy from the regulars which proved to be contagious; we had a swell time, chatting and playing pool. I did not inquire as to what the Big T actually was, poo on my reporter skills! Also, a wee bit of state pride is present here. If you ever need to thank god you live in Texas, just cast your eyes heavenward. Thanks to everyone who came along and for being flexible with the venue changes! Thanks to my photo gal, A.R. and the drivers of the evening. Also imported Houston peeps! Forever Young fact: a small jellyfish native to the Mediterranean Sea and Japan is thought to be practically immortal. Goodness, it has been an embarrassingly long time since a real post was written here. To be fair, I’m lazy. The day after Thanksgiving, my photographer and I headed over to Fredericksburg, TX. 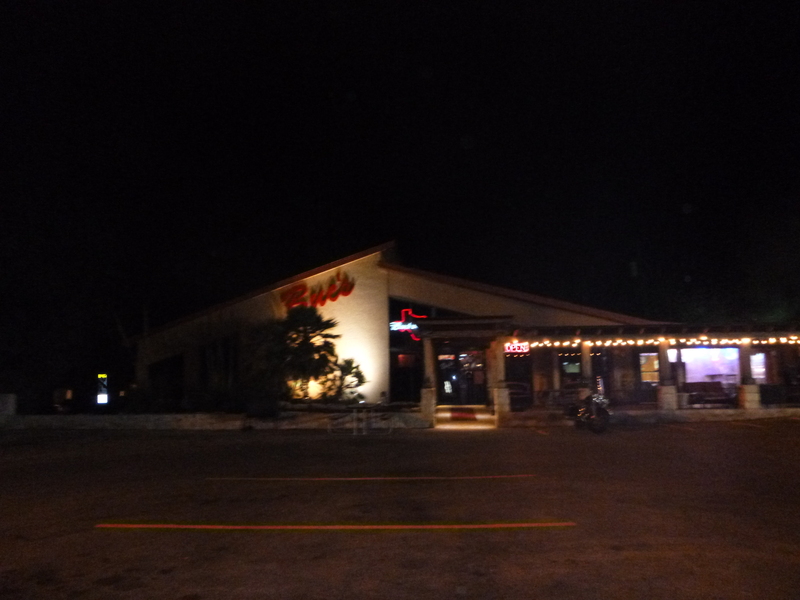 My first restaurant choice turned out to be a chain (esh!) 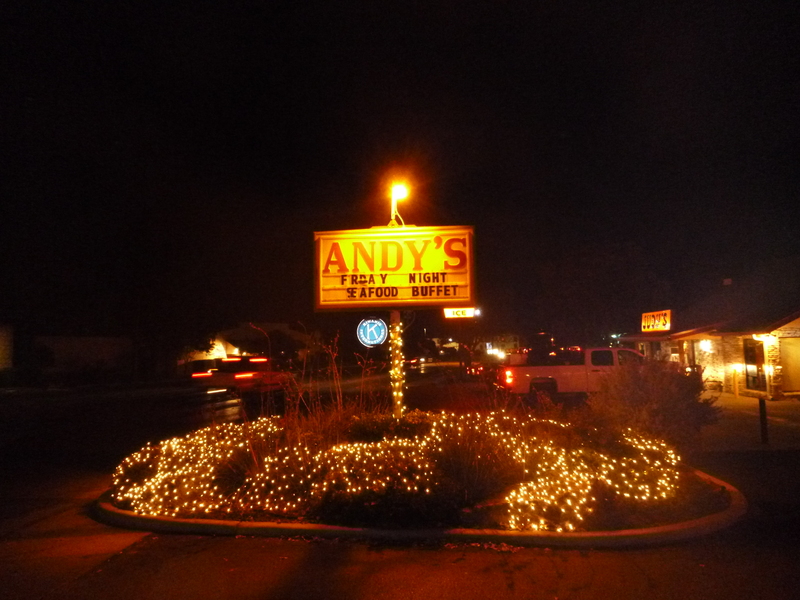 so we hit up the first place we saw while coming into town, Andy’s Steak and Seafood Grille, supposedly the oldest continually operating restaurant in Fredericksburg. This place very much has the small town vibe of the same customers who order the same thing every time. While the menu had a fair amount of options, I was torn on which item to choose and not because they all sounded enticing. Fare is standard Texas diner style: beef in various forms, uninspired vegetable dishes and an okay salad bar, which got instantly downgraded due to the complete lack of bacon bits. The horror! Let me explain: this is a hamburger patty with brown gravy, not unlike the more well known item of our childhoods, Salisbury Steak, with a piece of mildly cooked bacon tossed across it. Nothing about it was appealing. And to the people of Fredericksburg who eat this on purpose, no. 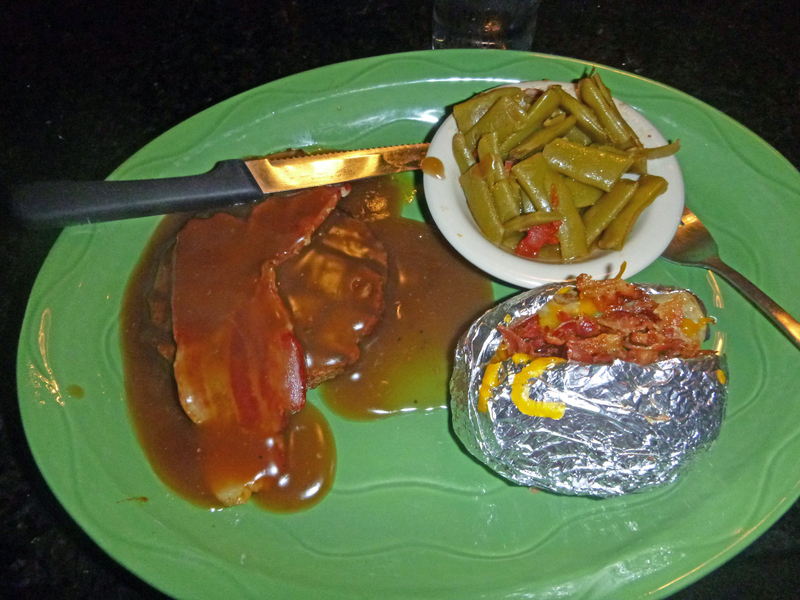 Also, there were three instances of bacon on this plate. I have special feelings for bacon just like the next guy, but I have seen it used too many times as a fix. Cooks of the World, bacon is not your band-aid. Personally, I felt the prices were a bit high but that may be the result of a tourist town establishment. Next, we went to Buc’s Bar and Grill. The early crowd mostly sat around the bar. We chatted with a slightly deaf older gentleman who asked us the same questions several times and, after some confusion, bought us a beer. 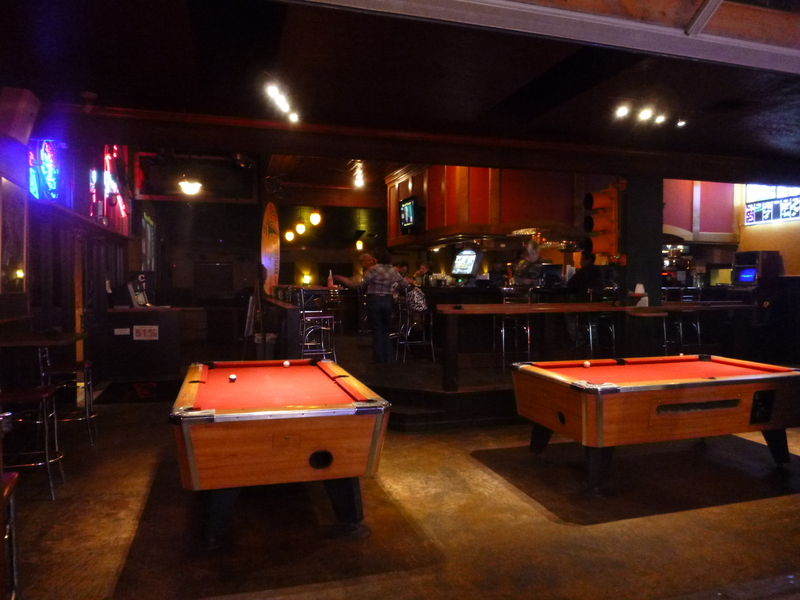 Once he wandered out, we utilized the surprisingly nice bathrooms and played pool (terribly). A nice selection of beer and friendly bartenders, it was oft repeated that this place is the after party hangout. Go later if you prefer a busier bar. 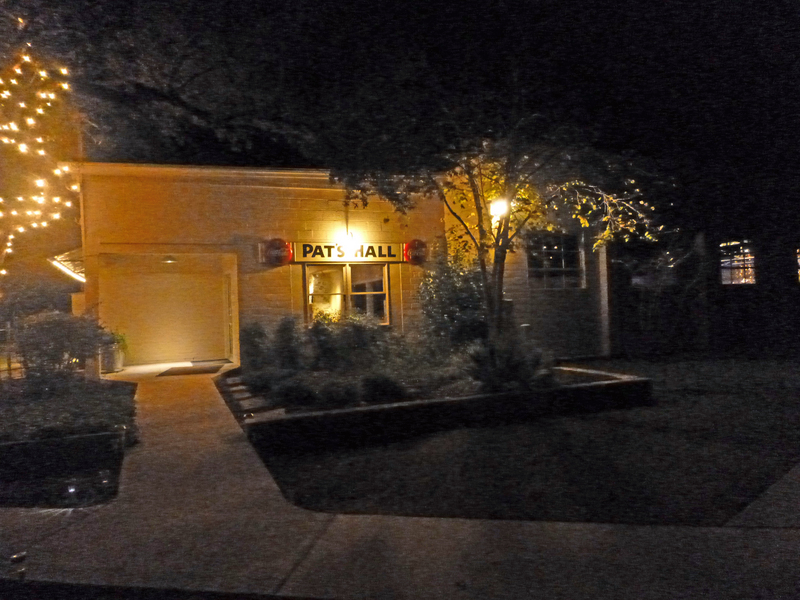 After Buc’s, we got stupidly lost despite what turned out to be good directions but eventually made it to Pat’s Hall. Originally opened in 1928, it is now owned by a couple who runs a publishing company out of it and rents it for events. Occasionally, dances are scheduled around such events. We walked in to an open room with cover charge ladies and a long stone bar behind them. The beer selection is wide and well priced. If you plan to sit, ensure a table reservation has been made. The outside area was well constructed around a huge, beautiful tree. Central heating and air could not be confirmed; bathrooms were small but nice. Although this honky tonk was not the typical wooden structure, the architecture is a snapshot if it’s time and is unusual for beer joints. Lots of dancers, from very young to very old. AND, my favorite dancer of all time was also there: The Trotter! See him once and you’ll know what I mean. He’s tall, he’s skinny and he trot dances like no one I have ever seen! Godspeed Trotter and God bless that woman who keeps up with you! Only fact involving Babe Ruth and veggies: Babe Ruth kept a cabbage leaf under his cap to keep cool.